MOEN is a dedicated manufacturer line of faucets, showerheads, sinks and more. Creating products with exceptional durability, innovation and sophisticated style. 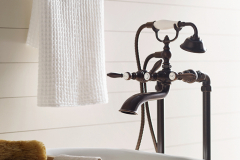 Moen offers a diverse selection of thoughtfully designed kitchen and bath faucets, showerheads, accessories, and more. From Eco-Performance technology to Lifetime Limited Warranty; they are as exceptional as they are exquisite. Dedicated to designing and delivering beautiful products that last a lifetime – all over the world. As a result of their dedication to their exceptional product line, Visionary Baths & More has decided to incorporate Moen into our product line and in our showroom displays. Our well-trained staff are able to answer questions you may have as well as help you in your design choices. Learn more about MOEN, click here.